A sheet of newspaper on top of the strong colony. A small slit in the paper is all that is needed. The weak colony is placed on top of the full sheet of paper. The new hive is now combined together, supers are on top. Note the paper sticking out the sides of the box. This time of year it is time to make the call. What do I do with a weak colony or hive that has recently swarmed leaving a hive depleted of field bees. By the first of July it is time to do something. I start combining colonies. If I have a package still in one deep I know it is not going to survive the winter. I combine it with another colony, preferably a weak one. To make them both better. If I only have one colony I have to live with what I have. I find the queen in the weak colony and euthanize her or put her in a small nuc box with some bees to save for an emergency.. Leave the colony queenless overnight. The next day bring the daily newspaper out to the bee yard. Not the small local paper, it is to small. I am talking Pioneer Press or the Star-Tribune. 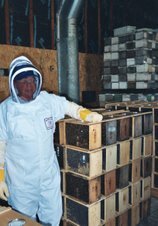 Open the strong colony and put one full sheet of paper on top of the hive. Take a hive tool and put a small slit in the paper. Slit not hole. Take the weak colony and set it on top of the paper. Put the cover on the hive and now we are one bigger happy family. The bees will chew through the paper in a couple days. The paper pulp will be laying in front of the hives entrance. Queen excluder and honey supers can be placed on top of the weak colony at this time. I expect to get honey off this colony. Active swarm cell, I stopped this hive from swarming by getting to this before it was capped. I have been getting calls for queens. The caller always says no eggs, no queen. I ask the question, Did your bees swarm? Caller: There is a lot of bees in there I am sure they have not swarmed. Me: Did you see any queen cells? Caller: Are those the long things hanging from the bottom of the frames? I cut them off, they are only on the bottom, right. Me: They can be anywhere, but usually on the bottom bars. If they were capped the bees have almost for sure have swarmed already. Caller: I only looked on the bottom. Me: Your bees probably swarmed. This is what I do. I take a frame with eggs and very small larvae from another hive. ( This is why it is important to have two hives. ) Shake the bees off it and put it in the queenless hive. After 4 days check the frame for queen cells. If there is none being produced I think it will be safe to assume that there is a queen in there. It has hatched from a swarm cell and she should be laying in about two weeks. Caller: I will try this, Thanks Jim. This type of call is very common. The swarming time can drive a person crazy. If I look for queen cells by pulling all the frames I may accidentally kill the queen that's in the hive. If I do nothing I end up looking up in a tree at the huge swarm that is 40 feet in the air. My compromise that I do is this. I open the hive, smoke the top of the hive driving the bees down. Looking down as far as I can see, I squash any thing resembling a queen cell. I then tip the box back and do the same thing. The frames don't fall out because they are glued down with propolis. I check all the boxes this way. I will also look for any cells hanging off the sides of frames. These could be supercedure cells and bear further investigation. Swarming behavior will continue until the major nectar flow begins. 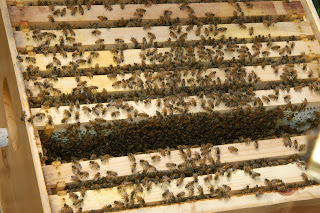 The heat, crowded conditions and a queen more than one year old all contribute to swarming. My package bees on foundation are on their second box. I still have feeder pails on. The bees will not make foundation unless there is a nectar flow. Even though I have a flow I will keep the feeder pail on until July 1. Failure to keep the feeder pail on can lead to swarming or a slower build up. The bees population is larger now. The bees will draw out foundation faster. It is important to keep an eye on the boxes. Boxes can get drawn out quickly. A week can bring significant changes. My helper, she watched me work for around 10 minutes, then moved on. Notice the white edges on my dark burr comb. This was an immediate indicator of a nectar flow in progress. New white comb at the top of the frame. Nectar is filling up the cells. A good shot of the cells at the top of the frame. The nectar is shimmering in the cells. One cell is already is starting to be capped. Checked my bees tonight at the bee yard at my house. I popped the cover, pulled up the inner cover and viola light comb. The bees have been filling a couple combs with new nectar. I have supers on but the honey they are putting up is in the top deep hive body. This colony was off an over- wintered colony that was average in numbers of bees. My packages or nucs don't have the same number of bees yet. Probably another week to 10 days on the nuc's and about 10 - 14 days on the packages when they will have about this number of bees. I had a helper watching me as I worked the bees. see the tall Black Locust trees showing off their showy white blooms. This bloom lasts about 2 to 3 days or maybe longer with the cool weather. Along the road edges the birdsfoot trifoil is just starting to bloom. Also near by in these same areas the yellow sweetclover is beginning to bloom as well. There is more white sweetclover coming along this season too, but will not be ready until the first or second week of July. The clover bloom should be better this year because of the rain, although it will be later than the last couple of years which were extremely early blooms. I planted yellow sweetclover and dutch white clover this spring in hopes that it will provide some extra bloom for next season after it gets established this year. It is a good year to start new plantings of these because of the cool moist weather. Clover seeds are available at the farm store on HWY 36 and Ideal ave. The farmer north of me has just cut his horse hay this week, so the second crop with alfalfa will be later as well, if at all. The basswoods are a week or more out as well. Where o Where has my nectar flow gone? This clover appeared in my yard after I made this post in the morning. The flower pod of a Basswood flower. Notice the yellow leaf hanging to the side. This is an easy way to spot Basswoods. The off color leaf is very visible. I will stop and look to see if the flowers have opened and are bees working it. On this tree you can see the off colored leaves at the top. The thing to remember is just because flowers are present it doesn't mean there is nectar for the bees. I am waiting for the nectar flow. I know nothing is happening here. The farmers around here have not cut hay yet. The alfalfa fields are normally cut in the first week of June. Now we are getting to the end of the second week and still no alfalfa. I looked at my Basswood trees and have noticed the flower pods have dropped and the immature flowers are there. It will still be at least another 10 days before they bloom. I have noticed some yellow sweet clover starting to bloom in the ditches around town. I don't know if bees get much off the yellow sweet clover in this part of the country. I think our humidity is to high. It is a major nectar plant in Nebraska and the Dakota's. The only way we know for sure is through observation to see if the bees are working the flower. I always look on the combs of my brood comb to see if a nectar flow is underway. I don't even pull any frames. A quick glance tells the story. The combs that are normally dark start displaying new white beeswax. This indicates nectar coming in as the bees add to the length of the cells and new cappings to seal the nectar. I know now I have to wait and see on the flow. I will have my supers on this weekend. My comb honey goes on when the flow is going. Words of wisdom from Dr. Basil Furgala " You can't make any honey if your supers are in the garage". I have some used equipment for sale. $300. or $5.00 a box, hive stand or cover. A great photo of larvae in many stages of development on black foundation. 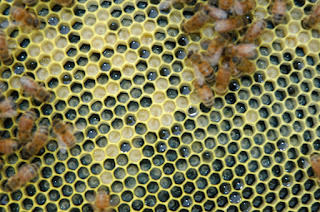 In the cells with the small larvae, they are sitting in a pool of Royal Jelly . Notice on the frame all the white glistening larvae. I It is very healthy looking. The color of brood is the telltale sign of disease. Whenever brood is any shade other than pearly white there is usually a disease happening. The packages have been building up. Most of mine are in need of another box. The weather has been a problem for a faster build up. When it is cool like it has been the bees can't expand the brood nest compared to when it is warmer. The bees have to cover the brood to keep it warm. The cold temperatures make the bees cluster, this year a little more than usual. The tighter cluster means less frames covered leading to a slower build up. I am still feeding the bees on foundation. I am being hopeful of a lagging nectar flow due to this unseasonable weather. Look for the first clover bloom. An old beekeeper told me that the main nectar flow starts about 10 days after the first clover bloom.